Strange, Austin, Bradley C. Parks, Michael J. Tierney, Axel Dreher, Andreas Fuchs, and Vijaya Ramachandran. April 2013. China’s Development Finance to Africa: A Media-Based Approach to Data Collection. Working Paper 323. Washington D.C.: Center for Global Development. The 1.0 version of AidData's Chinese Official Finance to Africa dataset tracks 1699 development finance activities in Africa from 2000 to 2011. The data includes both Chinese aid and non-concessional official financing. 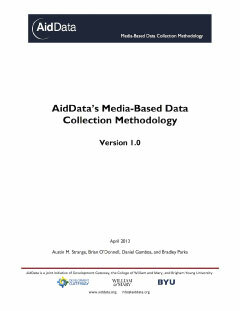 This dataset was generated as a pilot of an innovative open-source data collection methodology which pulls information from media reports, government documents and academic articles, and was created using AidData's Media-Based Data Collection Methodology, Version 1.0. Because our data collection methods are designed to dynamically improve project records, we advise employing the most recent version of the dataset for analysis.